Once upon a time, in the good ol' days, you could get away with jokes about the Aussies being convicts. Mainly because, centuries ago, that's where we sent all our criminals. Then they realised they were better than us at all the sports we had invented, and proceeded to whup us at them. Plus Neighbours, which somehow made us think they were all good eggs who never have more than half a pint at the pub. About as evil as it got was Lou Carpenter. Now though, Chopper has arrived to make us question whether Neighbours is actually realistic (hmm). 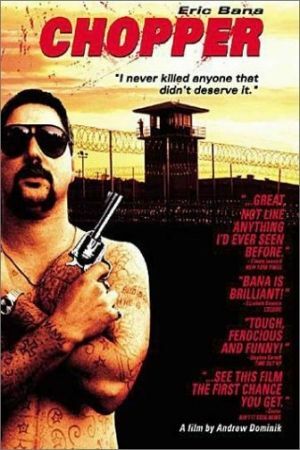 Eric Bana (Aussie comic in a brave and successful casting decision) plays Chopper, the relentlessly self-publicising gangland criminal with big dreams. The film traces his life both behind bars and trawling the underbelly of the villain's world, in his personal quest to achieve world-wide notoriety. And let's get it clear now, Chopper is totally mad, with an understated split personality disorder that sees him apologising to victims after it's too late. Andrew Dominik, basing his story around all the facts, manages to dispense with comment or judgement in his story, and instead allows an objective camera to roam free, observing the brutal and unsettling events as they unfold. The opening half is brilliant, the second a little less so, the whole is grim and uncomfortable, but also never less than fascinating viewing for those prepared for a tough ride.